Citing the desire to defend his country, Army Staff Sergeant Joe Gutierrez enlisted in the military in 2000 out of Mountain View, California. He honorably served in the Army before medically retiring in 2013. 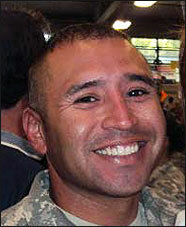 Staff Sergeant Gutierrez was deployed four times (three times to Iraq, one time to Afghanistan). Throughout his deployment, he suffered a left shoulder sprain, right shoulder sprain, cervical spine strain, lumbar degenerative disc disease and spondylosis, left lower extremity peripheral radicular parethesis, right lower extremity peripheral radicular parethesis, left knee patellofemoral syndrome, right knee patellofemoral syndrome, tension headaches, and posttraumatic stress disorder. Among the commendations awarded to Staff Sergeant Gutierrez were the Afghanistan Campaign Medal with Campaign Star, Iraq Campaign Medal with Three Campaign Stars, Army Commendation Medal (4x), Army Achievement Medal (7x), Meritorious Unit Commendation, Army Good Conduct Medal (3x) Army Reserves Components Achievement Medal, National Defense Service Medal, Global War on Terrorism Expeditionary Medal, Global War on Terrorism Service Medal, Non-Commissioned Officer Professional Development Ribbon, Overseas Service Ribbon (4x), and the Army Service Ribbon. Building Homes for Heroes gifted Staff Sergeant Gutierrez, his wife April, and their two daughters a home in Las Vegas in July of 2015. Army Staff Sergeant Gutierrez with daughter Shianne. Army Staff Sergeant Gutierrez with wife April. The family was gifted a home in Las Vegas in July of 2015.